Fantastic 3 Season Rental on Island Lake just northeast of Winter, WI and approximately 30 minutes east of Hayward, WI. For the fishing enthusiast...Island Lake is a clear 70 acre lake which is a Class A Musky lake and also has an abundance of Bass and Panfish. 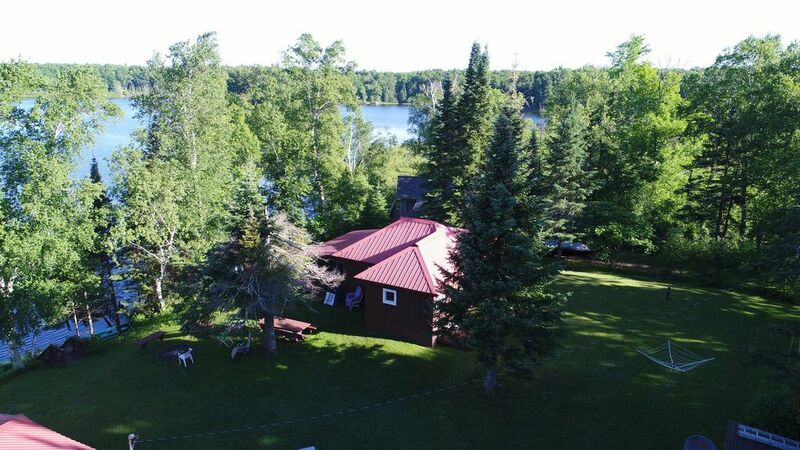 For the ATV enthusiast, the cabin is located a short distance from the Tuscobia Trail. The Golfer can enjoy some of the award winning golf courses in the Hayward/Cable/Winter area...Historic Barker Lake Lodge/Golf is a short drive away and was built by gangster "Gentleman Joe Saltis" in the 1920's. For some solace you can spend the day on the water by kayaking, tubing or canoeing down the Chippewa River from the Winter Dam to the Ojibwa Inn. It is a wonderful way to spend time with this leisurely 8 mile trip which has some of the nicest scenery in the world and a good place to watch some Bald Eagles at play. Have all the privacy of a small quaint lake with the flexibility to spend the day in Hayward or Cable and do some shopping, golfing, or dining. We look forward to having you as a guest in Winter, WI where you can wake up each morning to the sounds of our family of loons. Come up north and Summer in Winter! Hello, my name is Paul Canfield. I grew up hunting and fishing in these Northwoods while staying with grandparents. I enjoy staying at these cabins, and hoped to make them as comfortable as home. I knew the owners, two of the nicest people you could ever meet. When they decided it was too difficult to maintain the properties and make the 8 hour trip from Illinois, they asked me if I would be interested in buying them. I knew how much they enjoyed the cabins and knew the history of 20 years of family and friends and so it was an easy choice. I made some cosmetic improvements and decided to open them up to other families as we have adjacent cabins for our own. It is a wonderful place to relax and play and I hope you will enjoy it the way I do. The cabins sit about 50' from the water on top of a small ridge which overlooks the entire lake. There is an island in the middle which is the adopted home of two bald eagles which build a large nest every year. The lake is spring fed from a slew on the east side of the lake, which makes it very clear and refreshing to swim in. The deepest part of the lake is about 50' deep with most of it around 5-15' deep. We enjoy fishing, biking, riding the ATV trails, going to Hayward for golf/shopping, kayaking down the Chippewa River, hunting in the fall, and exploring the 1000's of acres of Chequamegon National Forest. It is truly a wonderful place to visit. There is also an exterior shower. Inside there are plenty of towels and toilet paper, hair dryer, and a newly updated shower. Plenty of hot water. Cabins are approximately 50' from the water with about a 12' elevation and great views of the lake. There's a gas wall heater as well as electric baseboard units. Satellite WiFi Available. NOTE: this is a limited data plan, meant mainly for checking email. Using this for Netflix or other streaming movies will cause the Wi Fi to either slow or stop altogether. Best to bring your own coffee but there's plenty of filters. There's all the dishes and silverware you need. Smoking is allowed on screen porch. We had a great weekend! Very well stocked. The screen porch was perfect for enjoying the sunset and view of the lake. Perfect place to relax and enjoy nature. Thanks for sharing this little piece of heaven. We sure enjoyed having a nice sized screen porch. We appreciated everything there to share in the kitchen,etc. The kids loved exploring the VHS movies and games. Very nice having plenty of bedding there. Kitchen needed a bit of cleaning before use. Nice advantage having window a/c with high heat. Fun sharing the firepit with cabin 5 folks. The view of the lake is gorgeous and nice to have launch right outside the door. This place was awesome and the kids loved it to. Wonderful accommodations! Beautiful setting and the owner was a great host! He had the cabin stocked with fun activities- games , indoor and out, movies etc. the cabin was cozy and comfortable. The access and views of the lake were magnificent! Furnished boats, kayaks a paddle boat and canoe made the trip even more enjoyable. Our 3 teenage boys loved it too! Fishing was excellent! We will definitely return- and we wouldn’t want anything different although, next time we will stay longer than two days!!! Thanks for the memories! The setting was beautiful. The lake was small and very peaceful. The haunting, eery but yet soothing sound of the loons serves as a constant reminder that you were in the northwoods of Wisconsin. The fish were eager to bite. We saw many deer and even a bear along the road. It was a short drive to Hayward and we made a day trip to Lake Superior. It was also a short drive to numerous state parks that included beautiful waterfalls. The national forest was also a short drive. All in all it was a great get away from our busy every day lives. Cute cabin but filthy & not prepared for our arrrival. We were so excited until we walked in the cabin. Not only was every surface covered in dead bugs which we understand is impossible to control, but, also, the cabin was filthy. One would expect that the cabin would be cleaned for our arrival. We spent about 2 hours cleaning, vacuuming, disinfecting counters, sinks , toilet etc, before we could even unpack our car to bring into the cabin. I will say that we did appreciate the beautiful view of the lake, having our dogs along, the wood for a fire & all in the cabin such as books, movies, flashlights etc. However, the fact that the cabin was not cleaned & ready for our arrival is unacceptable! In fact unbelievable. We left one day early as two nights, under the circumstances, was enough. The cabin was much cleaner when we left then when we arrived. Too bad. I cant believe anyone returns. If the cabin wouldve been prepared for our arrival, we would've booked again for next year. There is a grocery store in Winter, WI which is approximately 7 miles away. Hayward is 28 miles away and is loaded with tourist attractions like miniature golf, casinos, fish museum, lumberjack festival, shopping, American Berkibeiner, and more. There is a guest book at each cabin with information regarding the terms of the rental, community information, and recreational opportunities. For more info call or text Paul Canfield at 715-828-0819 or email paulallencanfield@gmail.com. Thanks for your interest.